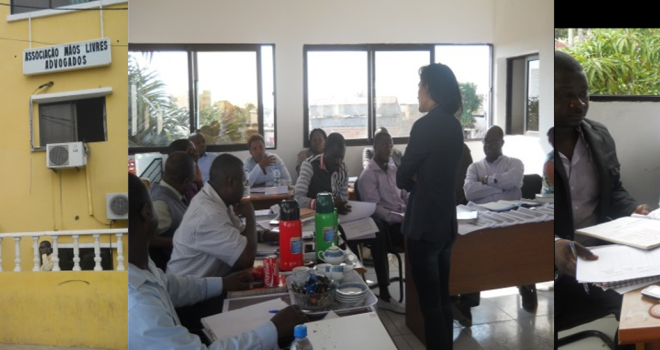 In mid-November 2013 members of the Angolan NGO Mãos Livres carried out detailed discussion and training on how best to conduct a pre-trial audit in Angola. Associação Mãos Livres has been providing free legal aid to poor people since 2000, including those held in detention. It is the only Angolan NGO that provides free legal aid. Although prison conditions in Angola have been previously documented by Angola, the audit planned by Mãos Livres will be the first systematic audit of case processes and conditions of detention. The audit will be based on similar audits conducted in Malawi and Zambia, and a pre-trial audit currently underway in Mozambique. Access to places of detention in Angola is very difficult. In Angola, visitors of those detained pre-trial have to pay for the privilege of visiting their relatives, and are also obliged to bring food, as the state does not provide food. Mãos Livres does however enjoy some access to places of detention in the nine provinces in which they currently operate.